Lacking any accomplishments and unable to influence events, National Organization for Marriage exists in order to raise money to continue to exist. In a blog post this afternoon Brian Brown, head of NOM, goes through a torturous account of just how awful the Supreme Court was to his cause. I wonder if Brown has considered that the Court could have left those cases in limbo – with the stays in place – awaiting future events from the appellate courts. Moreover, the action that the Court took required the assent of at least six of the nine justices given that only four are required to hear a case. The Supreme Court seems to have sent a powerful message. Brown just doesn't want to hear it. Pretend it's a dog whistle and it will go away. You believe marriage is the union of one man and one woman. Marriage should be decided by the people through the democratic and political process—not handed down from on high by unelected activist judges. In order to put an end to this corruption of our system of government, Congress should act quickly to pass an amendment to the Constitution and send it to the states for ratification. Apparently when the Supreme Court acts in a way that displeases Mr. Brown it is the result of corruption. More importantly, a constitutional amendment in favor of marriage discrimination is DOA. Impossible. First of all they don't have two-thirds majorities in both houses no matter what happens in November. Then where are the 38 states for ratification? 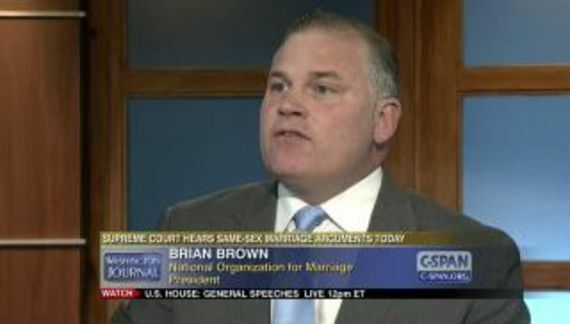 Go ahead, Mr. Brown, which 38 states might be likely to upend marriage equality? Equal marriage states seem to be doing just fine. Even in conservative Iowa, there's no traction for a repeal. That is because what is happening is just about what we said would happen. And that is nothing. Massachusetts is still firmly attached to New England. No comet strikes. No Tsunami. More importantly nobody can say that marriage equality has had a negative effect on society. If anything it has provided more structure and more security for the children of gay couples. The same is true in every state that has embraced equal rights. A constitutional amendment is a delusional notion in order to stay in business. This rests on just how stupid NOM's donor base is because this is dollars down the crapper. Over the last six years NOM has accomplished exactly zero while consuming tens of millions of dollars. Brown might have a pipe dream of managing a national campaign for ratification but it is not going to happen. It is a call to action and a sober reminder of the high and noble obligations which our age has placed upon us. And it is a reminder to me, personally, of how honored and humbled I am to stand in this fight with great and patriotic men and women like you. Because gay people and their allies aren't real Americans. They are not patriots. This is right out of the Nixon playbook along with his Silent Majority post in early August. The idea is to divide us into two groups and then pit one against the other. The idea that creating discrimination is a high and noble calling is not only offensive; It is preposterous. In fact, it is un-American.